Image and song courtesy of Third Floor Music. So. For days now I’ve been prancing around singing “Prooooooo-feeeeeeeee-ssor PYARE-lal!” I can’t stop, and it’s seriously beginning to make me want to kill myself. Perhaps I can purge myself of it if I write the film up and share a shortened version of the title song here to move the voodoo along. Sorry—but it’s a last-ditch effort for some peace! Hoo Haa! On this film’s plus side are that it is an homage to (some might say stolen from) Masalameister Manmohan Desai, and it contains my Beloved Shammi with the Always Utterly Fabulous Nadira by his side, villains Amjad Khan and Jeevan, flanked by an assortment of sideys like Sudhir, Yusuf Khan and Narendranath, Dharmendra (he may be older, but he is in FINE shape), Simi, whom I inexplicably love, and the catchy (sometimes too catchy, see above) tunes by Kalyanji Anandji. A cruel man, but fair! 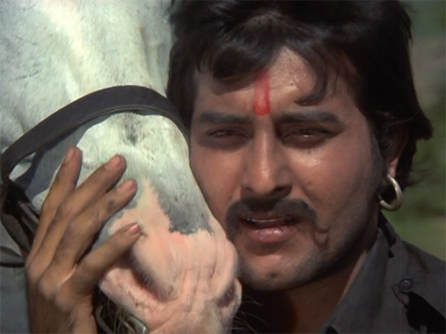 I sometimes think of Manmohan Desai’s films as being like a rodeo saddle bronc ride: as they erupt from the gate, the rider (i.e. director) is in control of the horse (i.e. story), and excitement builds until the rider is either tossed off or jumps off after his 8 seconds are up. Either way it ends with an out-of-control animal loose in the arena and the cowboy sprawled in the dust. In Gangaa Jamuna Saraswathi the rider is tossed off about halfway through his 8 seconds. Up to that point, the movie entertains with its twists and turns and stunning visuals; but the second half goes haywire until it tires itself out and limps to its conclusion. Too bad! because it had real potential. Whenever a “new” old Shammi film finally appears (with subtitles) on DVD there is much joy and celebration in the Memsaab household, tail-wagging (Gemma) and jumping up and down (me) and so on. If Asha Parekh is his co-star along with Pran, the celebration is even more prolonged. Sadly, there is no Helen; and despite her looming presence on the DVD cover (and in the cast list) no Mumtaz either, but these are minor issues in the face of heretofore unseen Shammi. 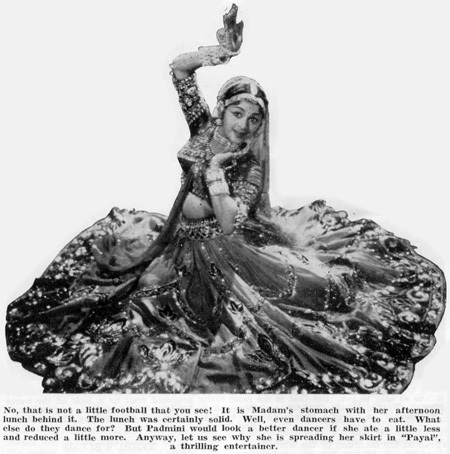 Shammi, Shammi, Shammi! 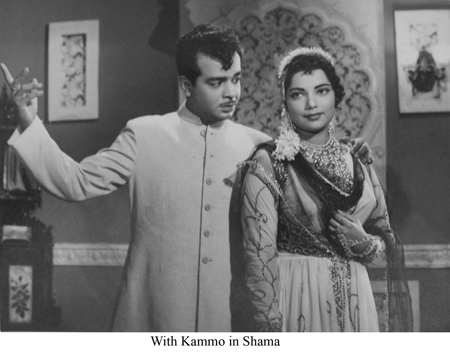 And happily, the first half of this film is quintessential early sixties Shammi-style frothy fun, as he bombards a reluctant and feisty Asha with his mischievous charm and romantic songs. But then everything turns suddenly dark, with death and blackmail looming large, and levels of gloom, self-pity and self-sacrifice rarely seen even by the most devoted Hindi cinema fan (me again). If you don’t mind a little movie multiple personality disorder, then you can probably tolerate it. If you prefer a logical narrative without completely over-the-top dramatics…then you probably aren’t reading this anyway. I sometimes have very vivid and detailed but thoroughly crazy dreams; I wake up and think: “What on earth?” and worry for a minute that there’s something wrong with me, then go about my day and forget about it. 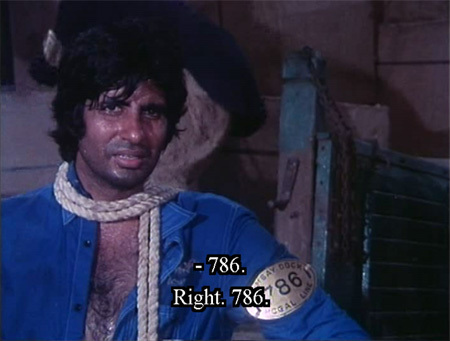 Now I know that Manmohan Desai had those kinds of dreams too, except that in the case of at least one of them, he woke up and thought: “That should be a movie!” And so he made Mard. It’s a trip through a demented sort of Disneyland, populated with characters from about a hundred different movie genres and policed by animals who are smarter than all the people around them combined. If you surrender yourself to the journey (and the film demands that you do) there’s a kind of lyricism and rhythm about it that’s hypnotic: it’s impossible to look away, but there’s an emotional detachment about it as well. You are just a spectator—so no worries!—but kya baat hai. Sixties charm in a 1971 film! Despite the lack of Shammi (and Pran), this movie embodies just about everything I love about that decade in Hindi cinema. 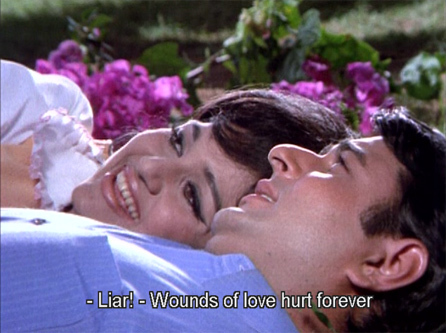 Lovely melodic songs, gorgeous scenery, a plot that stays on course and moves along briskly, Helen in a small part, and a feisty heroine (Asha Parekh, in one of my favorite roles of hers): ah, bliss! The best rainy day watching you can find. Navin Nischol stars alongside Asha, and though he doesn’t set the screen on fire, he is perfect here: an attractive, comfortably solid, gentle-humored guy with a good heart. 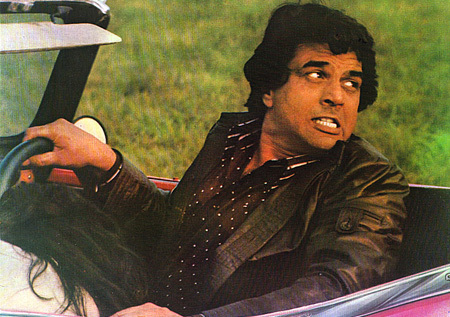 Comic actor Deven Verma debuted very competently as a director with this movie.